A shower kit can help you get a bathroom refurbished quickly and easily. With several new buildings coming up every day, the sizes of homes, flats and apartments have drastically decreased. Now many people are opting for smaller, more compact houses. With space being a constraint, it is up to every individual to make the best use of what’s available and this includes the bathroom. A great way to save space in a bathroom is by opting for a corner shower kit. In fact, shower kits in general make for a great and cost-effective way to refurbish your bathroom, giving it a more modern and up-scale look. While shopping for a shower kit, it is important that you are aware of the various types that are available as well as what each type has to offer. Listed below are some of the common types. Complete, enclosed shower kit: As the name suggests, this kit comes in a complete package including a shower rail, shower head, shower hose and shower dial. Some such kits also include shower jets. Most such kits also feature a backboard and a front glass, both of which are capable of standing on their own without any support. Shower Hose: These are shower kits that don’t come with a backboard. 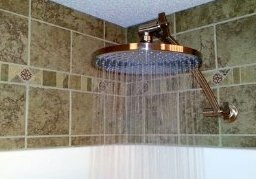 This type of a shower kit is also known as shower head or shower rail. They are available in various designs and in different colors that can compliment all types of bathroom décor. Enclosed Steam Shower Kit: Though not as popular, these shower kits come with a shower enclosure and a steam unit, embedded into one unit. They include other features like shower jets, rails, hoses and heads. They are probably the most expensive of the lot. 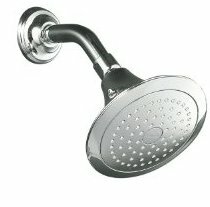 Shower panel: This is the most basic type of shower kits and is usually hand-held, thought they may include a shower-head too. They are relatively cheap and can be easily installed in bathrooms. The greatest benefit of opting for such kits is the conservation of bathroom space. Bathrooms are usually the smallest room in a house and are generally very cramped up. However, with shower kits, you can make this room even more spacious without compromising on style. Shower kits are also excellent for turning extra but small spaces available in your house into a shower rooms. Since these kits are available as enclosed structures too, you don’t have to spend extra on building new infrastructure or paying some a huge among of money to install the kit. A shower kit is also an excellent way to refurbish your otherwise boring bathroom into something more modern and ultra-chic. This method is cost effective and you can choose a kit that best suits your budget. Moreover, you don’t have to re-do your entire bathroom décor so that the new kit compliments it. You can always opt for colors and designs that go well with what you already have in your bathroom. Hence, at reasonable rates, you can have an almost brand new bathroom that matches the beauty and elegance of the other rooms in your home.